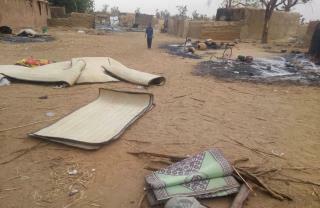 (Newser) – The death toll from a massacre in a central Malian village rose to 134 dead, the UN said, as new video emerged Sunday showing victims strewn on the ground amid the burning remains of their homes. An ethnic Dogon militia already blamed for scores of attacks in central Mali over the past year attacked an ethnic Peuhl village just before dawn on Saturday. Among the victims in Ogossogou were pregnant women, small children, and the elderly, according to a Peuhl group known as Tabital Pulaaku. Graphic video obtained by the AP shows the aftermath of Saturday's attack, with many victims burned inside their homes. A small child's body is covered with a piece of fabric, and at one point an ID card is shown covered with blood. In the capital of Bamako, visiting UN Security Council President Francois Delattre, condemned the killings as an "unspeakable attack" late Saturday. At least 55 people were wounded and the UN mission in Mali said it was "working to ensure the wounded were evacuated." In New York, the UN secretary-general condemned the attack and called on the Malian authorities to swiftly investigate it and bring the perpetrators to justice. Islamic extremists were ousted from urban centers in northern Mali during a 2013 French-led military operation. The jihadists scattered throughout the rural areas, regrouped, and began launching numerous attacks against the Malian military and the UN mission. Since 2015, extremism has edged all the way to central Mali where it has exacerbated tensions between the Dogon and Peuhl groups. Nowhere in this story does the word "terrorism" appear. The perpetrators of this act are described as "extremists" but not murderers or terrorists. Way to soft-pedal Muslim orthodoxy . Its really sad that in 2019, the world is still not at peace. No one learns from history. Who kills children, women and old people? That's embarrassing. Its evil. Mali is in a bad location. They should build a wall.